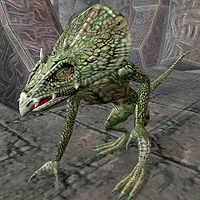 A fierce, large lizard-like Daedra which is commonly sought for its heart which is used in Alchemy. Lord Drekhva Yashaz is a unique Dremora found in Yashazmus. 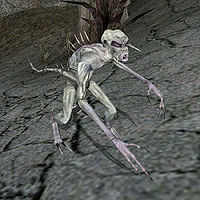 They are occasionally found in Daedric Shrines and in caves. 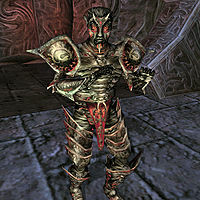 The Hunger is one of the many servants of Daedra Lord Boethiah and is known to be capable of quickly destroying its opponents' armor and weapons. The Hunger uses its long tongue to attack as well as its claws and spells. A summoned Hunger can make a useful guardian against a well-armored foe. Very large, but none too intelligent, servants of the Daedra Lord Malacath. 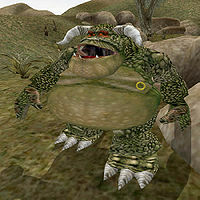 A weak and cowardly servant of Mehrunes Dagon. Both the most common Daedra in the game and the weakest. They are immune to unenchanted iron and steel weapons. 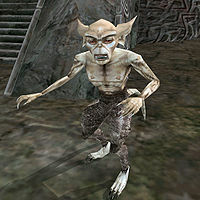 These Daedra are only slightly intelligent and typically attack on sight. They have often served Mehrunes Dagon. This page was last modified on 6 March 2019, at 07:35.